Frozen Custard vs Ice Cream: Is there a difference? | Winners Drink Milk! Inquiring minds want to know: Is there a difference between custard and ice cream? Frozen treat connoisseur and Dietetic Intern, Cassidy Moye gives us the scoop. Summertime is a time for water parks, barbeques, and ice cream! Whether it is on a cone, in a dish, or as a shake, ice cream is a staple in the summer heat. With its cold creamy sweetness, it is unimaginable for anything else to be as refreshing and delicious. I thought this too until I discovered frozen custard at eighteen years old, in which it changed my outlook forever. From working at a restaurant that sells custard to another restaurant that sells ice cream, I’ve had my share making delicious sweet treats for customers. With unlimited options of toppings and variations, a customer can make their dessert their own way and in a different way every time! Some popular options for either custard or ice cream parlors are fruits such as strawberries, bananas, and pineapples, as well as an abundance of candy and cookie bits. Underneath the toppings and drizzles, the dessert is a delicious treat all on its own. Comparing the two desserts, there is not much of a difference in nutritional content either. Custard will sometimes have more calcium and more protein, depending on the recipe, but nothing consistent. The main difference between the two yummy desserts is still the creamy texture of custard, so enjoy what you like! 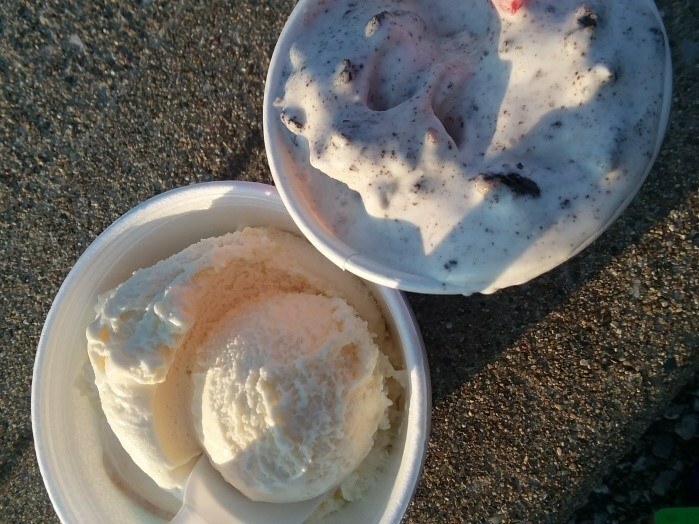 Whether an individual is at an ice cream or custard stand, both desserts will satisfy those taste buds on a hot summer day. The varieties with topping and syrups are endless and all are a great option for either sweet treat. The choice between custard and ice cream is dependent on individuals’ preferences as well as location opportunities. Looking for some homemade ice cream recipes to try? Try one of these blue ribbon recipes from the Indiana State Fair.